"Kanye West’s sixth solo LP, Yeezus (Roc-a-Fella), is a messy pile of contradictions: a rap record that sounds like industrial music, it vacillates between enlightened political consciousness and garish celebrity complaints, between self-aggrandizement and self-loathing, and between snarling noise and hooky pop," writes Miles Raymer in Soundboard. West plays tonight at the United Center. Or maybe you're in the mood for jazz? Peter Margasak recommends DKV Trio. "The trio has been sporadically active over the past few years, yet even when these guys haven’t worked together for many months they can lock in at the drop of a hat, improvising over imperturbable grooves and gritty melodic motifs," he writes. They'll play tonight at the Hideout. 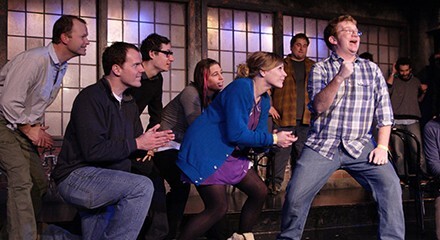 Did you ever wish that you could spend 24 straight hours inside the Second City complex doing nothing but watching improv and listening to music? Well, today's your lucky day: it's The Second City That Never Sleeps. Comedy provided by Fred Armisen and Lil Bub, the world's most amazing cat; music by Bob Mould and Sally Timms, among many others.